What’s Next for Excel Hand Dryers? The Next Big Thing is Here. Wow; talk about a quandary. In the sobering quote above, our very own Denis Gagnon harkens back to 1997, speaking of his early days as proprietor of Excel Dryer, Inc. As he explained to Robert Siegel, co-host of the popular, long-running NPR program, All Things Considered, a challenge lay before Denis’ newly acquired Massachusetts manufacturing outfit. Commercial washroom users wanted dry hands—fast. Recognizing from the get-go that electric hand dryers just did not work quickly enough, Denis initiated the gradual end of the BXE (that’s right; the Before XLERATOR Era). What followed were some progressive years, to say the least, and fixing that initial problem of sluggishness was just the beginning. For the 2013 All Things Considered segment profiling Excel Dryer, Siegel had visited our East Longmeadow headquarters, learning firsthand just “How One Company Reinvented the Hand Dryer”—as the segment was ultimately (and aptly) titled. During Siegel’s enlightening tour of our facility, Denis relayed details of his own first visit to another Massachusetts company: Invent Resources in Winchester, nine miles north of Boston. Its founders, four young scientists with a passion for innovation, had reached out to Excel Dryer with an idea for faster drying technology. Unlike nasty germs that our products help keep at bay (more on that below), word of this extraordinary new technology spread fast. 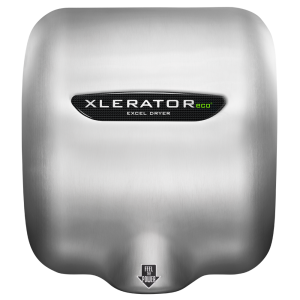 The XLERATOR had created the high-speed, energy-efficient category of hand dryers, and soon dotted the globe with its unprecedented drying power. With that, Excel Dryer settled in as the international leader of its industry. 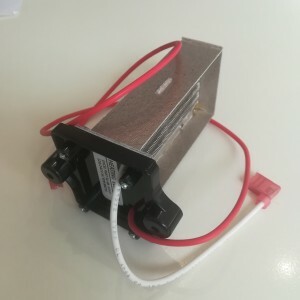 With XLERATOR’s breakthrough success as a sustainable, cost-effective and hygienic electric hand dryer, we asked ourselves: How can we expand on this? 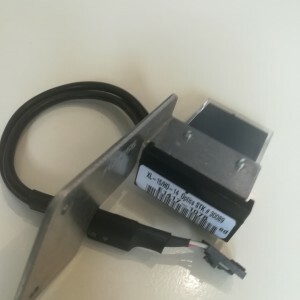 How can we enhance the product itself? As the answers materialized, Excel Dryer ultimately introduced exactly what we’d intended: our Expanded and Enhanced product line of high-efficiency hand dryers. 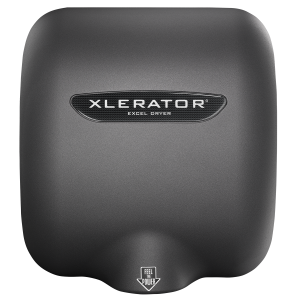 Using 80 percent less energy than conventional hand dryers, and reducing a facility’s hand-drying carbon footprint by 50 to 75 percent versus even 100-percent recycled paper towels, the original XLERATOR was already a huge environmental win for businesses. 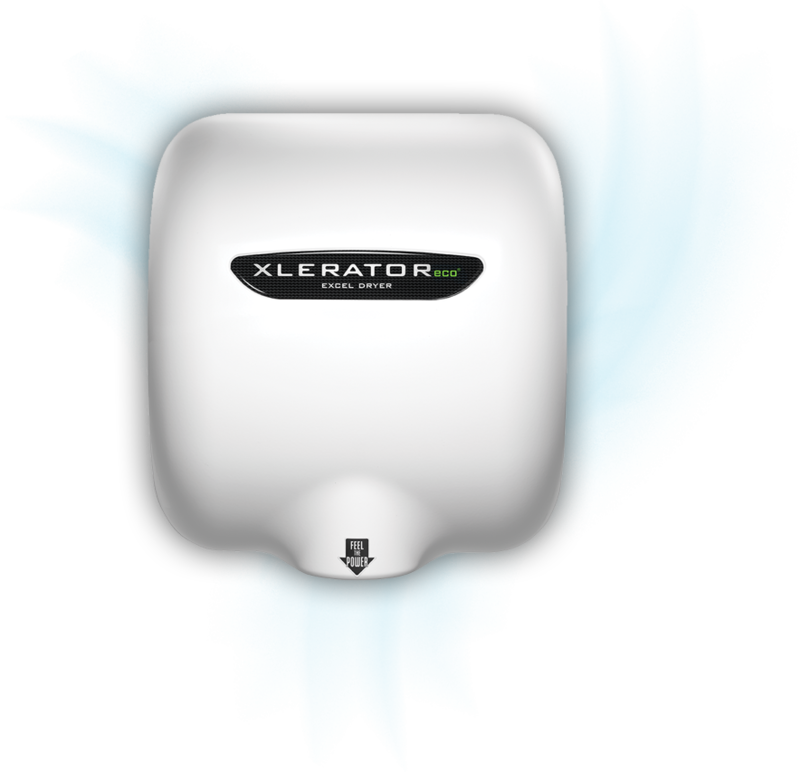 Then, in 2014, we ran the extra green mile for our expanded line of products: Excel Dryer announced the new XLERATOReco® Hand Dryer. Its no heat technology dries hands in 10 seconds* using only 500 watts, creating the most energy efficient and environmentally friendly hand-drying solution on Earth. 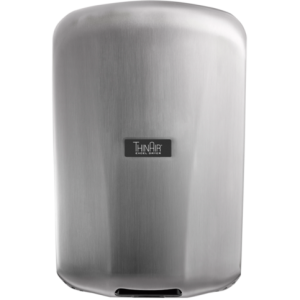 In 2015, we debuted our ThinAir® Hand Dryer, the sleekest member of our product line. A surface-mounted, ADA-compliant hand dryer, ThinAir meets ADA protrusion guidelines for the visually impaired. And that was just the expanded part. 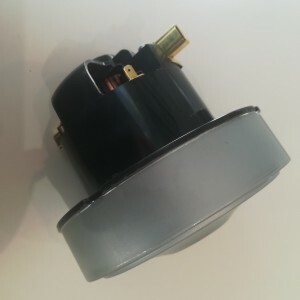 We’d also refined the original XLERATOR model—and built the two new products—with enhanced standard features, including adjustable sound, speed and heat controls, an externally visible service LED for streamlining maintenance and multi-voltage options of 110-120V or 208-277V. Offering a touch-free, hands-under design as well as the most options and complete line of accessories in the industry, our products notably represent the most hygienic hand dryers available. When specified with our antimicrobial Wall Guard and our HEPA filtration system, which removes 99.97 percent of potentially present bacteria at 0.3 microns from the air stream, there is no hand-drying solution more sanitary. Collectively, what the above-mentioned features truly speak to is our commitment to customizability. Every facility should have the freedom to create an ideal drying solution for its washroom environment, in terms of both operation and aesthetics. For the latter element, XLERATOR’s signature offering of custom covers, available in any DuPont color and with an option for personalized digital imagery, has become an industry game changer. The way we saw it, the next natural step was to take the benefits of XLERATOR off the wall—and onto the sink deck. In 2017, we unveiled the sink-mounted XLERATORsync® Hand Dryer, designed for integration with the D|13 Sink System and available exclusively through D|13 Group in the United States. A cohesive solution that addresses numerous challenges in effective washroom design, the D|13 Sink System synchronizes the hand washing and drying process, bringing together soap, faucet and high-efficiency dryer on each sink basin. As part of this exclusive one-stop system, the XLERATORsync provides intuitive operation, a polite user experience and an agnostic aesthetic that complements other high-end fixtures. Enough excitement for one year? For some manufacturers, maybe, but our most exciting endeavor had yet to come. 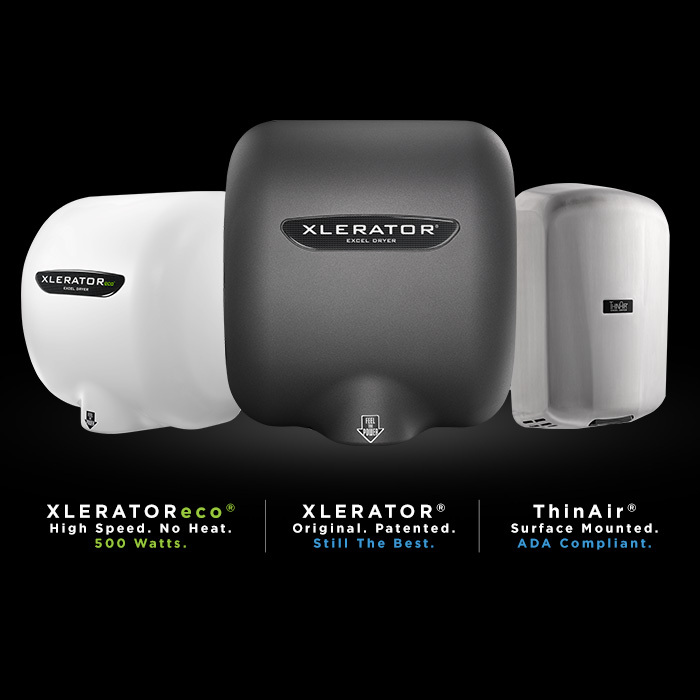 UL Environment, a business division of Underwriters’ Laboratories, recently published Environmental Product Declarations (EPDs) for the XLERATOR®, XLERATOReco® and ThinAir® Hand Dryers—substantiating our environmental claims on these signature products and marking the hand dryer industry’s first and only EPDs. And we’re proud to agree. *Dry time and energy use testing performed by SGS International on standard XLERATOR/XLERATOReco Hand Dryers with 0.8″ nozzle to 0.25g or less of residual moisture, pursuant to the UL Environment Global Product Category Rules (PCR) for Hand Dryers.